Ferment yeast along with sugar and warm water. Rice should be soaked for 4 hours. Grind raw rice, cooked rice and coconut. For grinding, add coconut water instead of normal water. Adjust water according to this. Add yeast-sugar mixture to this and keep for fermentation for at least 8 hours. Keep the appam pan on flame. Pour a spoon of this batter in the pan and just rotate it once, so that it spreads to form a round shape. 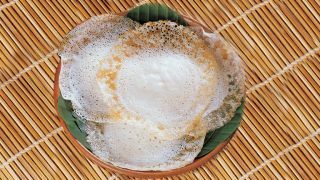 Close the lid and cook the appam. No need to turn the other side. Ends should be crispy. The best side dish for appam is vegetable kuruma, chicken stew/kuruma.